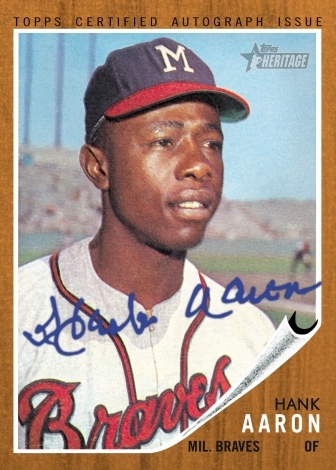 Hank Aaron and Frank Thomas have a busy week ahead of them. As part of Topps 60th Anniversary launch, “Hammerin’ Hank” and “Big Hurt” will be Topps pitchmen this week. The nationwide media tour will start tomorrow and will be highlighted by Aaron as a guest on The Late Show with David Letterman. They will also appear in USA Today, New York Post, New York Daily News, WFAN, WGN, FOX, ESPN and Sporting News. Nice to know that these big names are behind the hobby.